An Ontario dog owner is warning others about the hazards of dog grooming after her American Eskimo dog's neck was accidentally cut at a salon. Grooming can be hazardous to your dog's health, an Ontario dog owner says, after her pet's neck was slashed during a session at a salon. "The groomer called and said, ‘I was shaving him and I cut him real bad. You need to come now’," Shannon Mills told Go Public. "I panicked. I wasn’t sure we would be able to get him to a vet before he bled out on the floor. I had never seen an injury like that on an animal before." 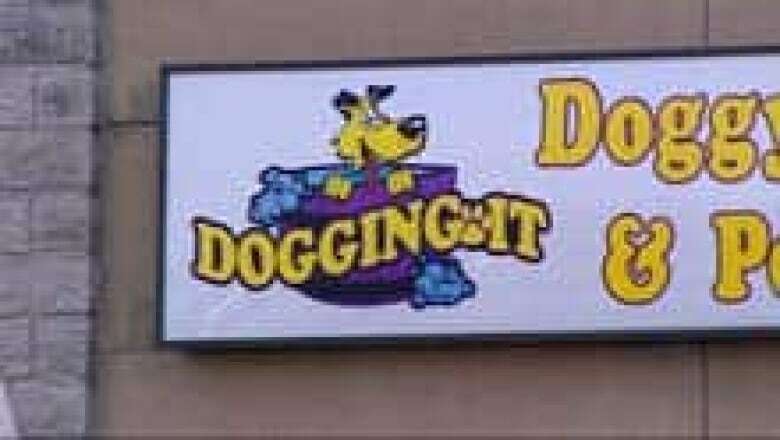 Mills, who lives in Kanata, had taken Joey, her eight-year-old American Eskimo, to Dogging It, a grooming business in neighbouring Ottawa, for the first time. 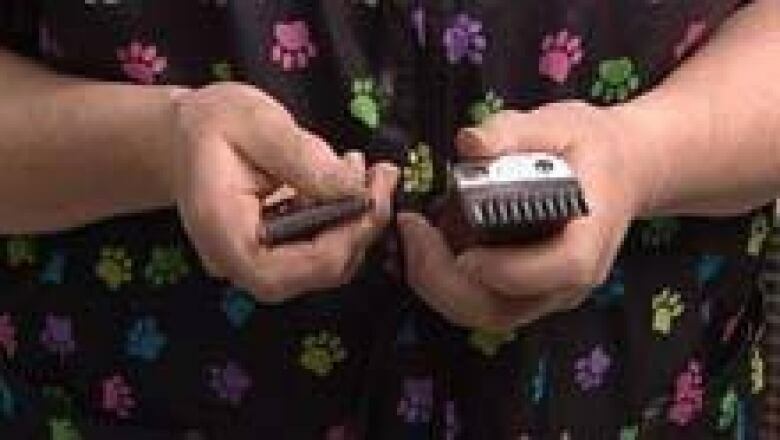 She said she specifically asked the groomer to cut her dog's hair, not shave it. When she came back, Mills said, she was shocked to find Joey had been completely shaved and suffered a large, open wound in his neck. "He had been shaved down so severely … that on parts of his body his skin was actually showing through," Mills said. The owner of the salon, Kathy Stratton, rushed Joey to a veterinarian with Mills following close behind. The laceration wound was treated, and the vet also found fresh bruises on the dog’s body, Mills said, adding Joey spent weeks recovering. "The first week was absolutely horrendous. He had to be on pain medication," Mills said. "His recovery has been quite slow." However, the owner of the dog grooming shop initially refused to pay the $1,400 bill from the veterinarian. "My dog has suffered, and I think it would have been very easy for the owner of the business to simply say, ‘Yes this was a mistake on our part, I will cover this.'" Mills said after Stratton talked with the groomer, the story about what happened to Joey changed. She said Stratton told her the dog had thin skin and claimed it had been punctured by the groomer’s thumb. 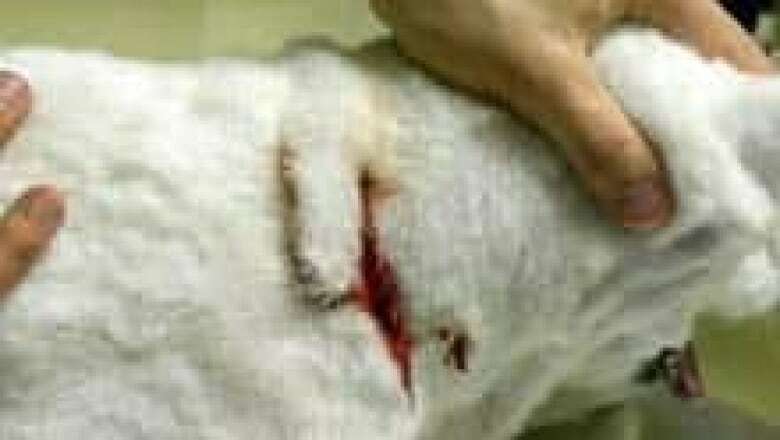 "She started saying that her thumb had gone through my dog’s skin," Mills said. "I can’t believe that anyone could possibly tell me a story like that." Joey has since had several tests on his skin, which were inconclusive. However, records suggest it’s unlikely he has the type of rare skin condition that could result in such a serious injury. When CBC News contacted her, Stratton admitted the large cut had been caused by her employee's shaver. "The injury was caused by the razor – absolutely," said Stratton, who also said she will pay the vet bill because "I would like to defuse this and get on with my business." Stratton said the groomer involved has been with her for three years. She also said Joey was the only dog ever injured at her shop in five years of business. Mills said she believes Joey would have been fine if the groomer had given him a haircut as she said she requested: "There wouldn’t have been a sharp object that close to my dog’s neck if he hadn’t been shaved." Stratton said unless owners explicitly say otherwise, groomers at her shop always shave the hair as opposed to cutting it, because shaving takes less time. Dog groomers in Ontario and British Columbia told CBC News that rapid expansion in the industry has led some shops to cut corners. Dina Popadiuk, a certified groomer in B.C., said some save time and money by giving dogs quick shaves instead of cutting the hair, which takes much longer. "They’re trying to do too many dogs too fast," Popadiuk said. "[Price competition] means you’ve got to do more dogs in order to make the same amount of money." There have been several recent cases in the U.S. and Canada where dogs were apparently shaved too closely by groomers. In one American case, a dog was badly burned after being left alone under a hot dryer. In two other cases – one in Seattle, the other in Hawaii – dogs' ears were allegedly cut off and then glued back on by the groomer, presumably in an attempt to cover up what happened. In the trendy dog services industry, Popadiuk said, anyone can open a grooming salon. The job can be difficult for inexperienced staff, she said, especially if the animal is hard to handle or hasn't been groomed for a while. "Some people have never gone to a school, have never been taught how to properly use equipment like shavers," she said. Experienced groomers know double-coated dogs such as Joey should never be shaved, she said, especially if they are rushed. "We hold the coat up and we comb down, trimming layer by layer," Popadiuk said. "It takes a lot of time." In Ontario, the National Agency of Pet Grooming Schools is lobbying for provincial legislation to require all dog groomers to be fully trained and licensed. "Grooming shops … are popping up on every street corner across Canada," wrote spokesperson Lesley Weeks, a leader in a nation-wide movement among groomers for standards designedy to prevent injuries and infection. Victoria Shroff, a Vancouver lawyer who focuses on animal law, said that since there are no regulations, owners should be much more aware of the hazards. "A dog could be very seriously injured and could actually lose his life, which is not something most people would associate with dog grooming," Shroff said. She suggests dog owners ask their veterinarian to recommend a groomer, then ask a lot of questions at the shop and stick around to oberserve how the dogs are handled. She also suggest pet owners think twice before signing a waiver at the salon. Many of them say the groomer is not responsible for any injuries, which could make it difficult for an owner to pursue legal remedies. "There are so many animals now; we are going to have that many more shops cropping up with little or no training and people with little or no experience out there taking sharp instruments to your dog," Shroff said. Mills said she feels terribly guilty for what happened to Joey, particularly because of his background. "He’s a rescue. He was delivered from seven years of total neglect. He was chained to a doghouse. He wasn’t even given a name by his owners, so when I adopted him I made a promise to him that he was going to have joyous days for the rest of his life," she said. "I lie awake at night thinking that there is going to be another incident involving another dog."